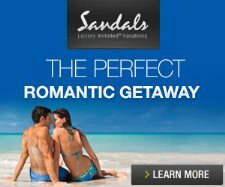 Unique to Sandals Negril Millionaire Honeymoon One Bedroom Butler Suites are located within the Plantation Building. All units have a living room and separate bedroom area, butler service, concierge service, and 24-hour room service. Most notable is the private pool sanctuary which is only included with the (RJ) category. Both (OP) and (PS) are 2nd floor units with balcony. (RJ) Millionaire Honeymoon One Bedroom Butler Suite with Private Pool Sanctuary - Lavish West Indian mahogany-carved furnishings. Bedroom with 40" plasma TV and king bed. Separate living room with fully stocked bar and another 40" plasma TV. Bathroom with double vanity, whirlpool tub, and separate walk-in shower. Lush garden area with privacy wall includes plunge pool, miniature waterfall, and outdoor shower. Butler, concierge, and 24-hour room service. Located ground floor of the Plantation Building with views of the private lush garden area. 5 units. (OP) Millionaire Honeymoon Oceanview Penthouse One Bedroom Butler Suite - Same suite as (RJ) except no private garden area. Instead, the suite is on 2nd floor with large balcony overlooking the ocean. 2 units. (PS) Millionaire Honeymoon Penthouse One Bedroom Butler Suite - Same as (OP) but with garden views. 1 unit. Living room area (RJ) cagegory. Bathroom within the (RJ) cagegory. View of the upper floor (OP) Millionaire Oceanview Penthouse Butler Suite category featuring ocean views. Upper floor (PS) category which features garden views.